Over at The Circle Way Practitioners Group on Facebook, several people responded to the question "What is your favourite item in your circle kit and why?" 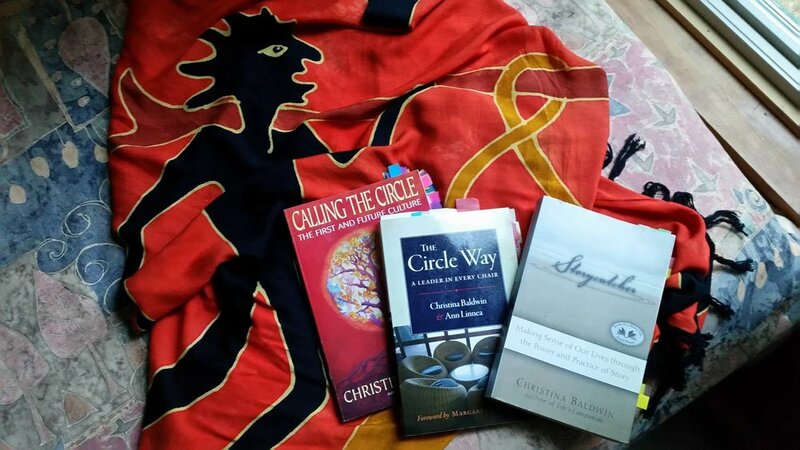 Lori Sortino: Besides the obvious collection of books, it's my scarf that I received at The Circle Way Practicum on Whidbey Island. First, I love scarves/shawls. And second, once I heard that it was tradition that everyone who attended got one (a tradition started by Ann and Christina), it took on a deeper meaning for me. It was with me throughout the practicum. Each of us had a different one. We might wear different clothes each day, but this scarf was the same, around our necks, on our chair, or laid on the floor between our chair and the center to represent the spokes, these incredibly magical shape shifting scarves became deeply loved. Emily Gillies: I recently bought a new circular cloth for the centre! It's big and colourful and engaging. Love it. Upon purchase the commitment in my heart was to see me leading more of this work in the world, and having this mat does inspire me to set up new Circle opportunities, it makes me feel energized when preparing, and it helps me visualize all the meaningful conversations that are just waiting to be co-created into the world! Thanks for the great question. This work is very close to my heart right now. 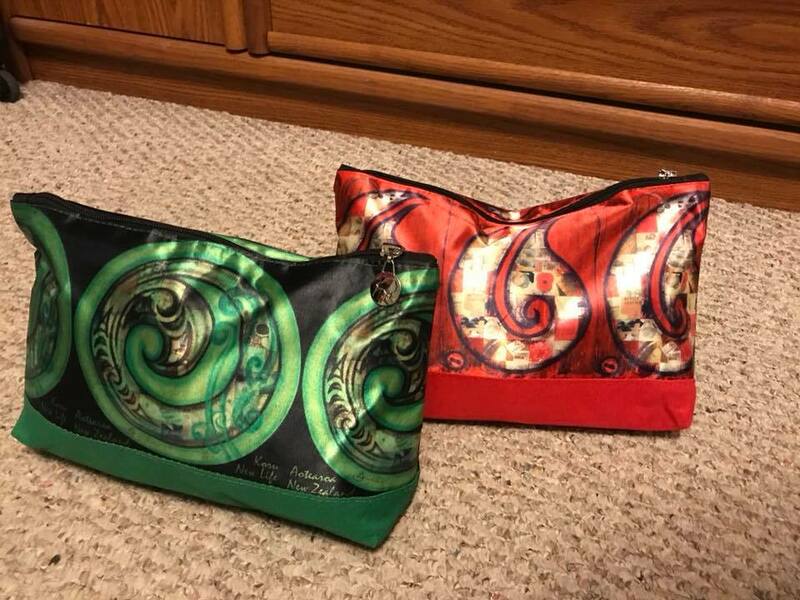 Heather Plett: My new favourite thing - matching pouches from New Zealand to carry the tools of the trade - one for talking pieces, bells, etc., and one for cards and other goodies. Amanda Fenton: I couldn't choose just one! One of my "go to" talking pieces is this silver heart (not sure exactly what it is made out of but it is solid) - it was the first talking piece I got and has travelled many circles. I found it on Bowen Island which has a special place in my heart as my first journey there sparked my life path into circle and participatory leadership. The heart becomes warmer as it travels around from hand to hand and people often comment about that - a lovely metaphor to how our hearts can warm to others in circle. The other is a talking piece I picked up in Bregenz, Austria when I was there for some workshops and gatherings in The Circle Way. It is a really unique, heavy pyrite sphere that I sometimes use for story councils or a quarterly women's circle I co-host. It is particularly sparkly in the candlelight of a centre. Olivier Winghart: My talking stones and little japanese bell — maybe not so imaginative, but effective! If you have any type of local meditation stores or bookstores that sell "more than books" (e.g. sound and healing items) you'll be able to find singing bowls and tingshas and stones. And Amazon is also an option. Battery-operated tealights make simple centres. Finding each element is an opportunity be selective and personalize to your tastes and the context of the circles you'll be hosting. For a list of items to include: a bell or sound-maker (my favourite is a small singing bowl), a talking piece (e.g. a stone), and something for a centre (e.g. a battery-operated tea-light or small cloth). You can keep it all in a zipped pouch that makes it easy to grab-and-go. Share in the comments below: What is your favourite item in your circle kit and why?